In an opinion piece published by the English-language paper Iran Daily, Mansour Mohammadi, investigates the recent developments in Turkey and the challenges ahead for President Recep Tayyip Erdogan and his party. Turkey’s ruling Justice and Development Party (AKP) regained its parliamentary majority in snap elections on Sunday. President Recep Tayyip Erdogan called the vote after the AKP lost its parliamentary majority for the first time in 13 years in June and its attempts to form a coalition government failed. In the wake of the party’s victory, it will be in a strong position to take control of all remaining levers of power: The army, security services and the media. However, there are many challenges in the way of the single-party government. The latest parliamentary polls were held amid domestic and foreign problems. Economic improvement in the country, that was always believed as a bargaining chip for the AKP, now has begun to fade as the inflation and unemployment rates have surged, the Turkish lira dropped in value against other currencies and the level of foreign investment declined. However, the Turkish currency and shares in Istanbul surged in response to the election results. But an economic crisis could still loom. The party won substantially more than the 276 seats needed to form a government alone but fell 14 seats short of the number required for a referendum on changing the Constitution and increasing the powers of the president. With 60 more seats, the government would have been able to bring in those changes without a referendum. After two years of cease-fire with the Kurdistan Workers’ Party (PKK), conflicts flared up in the past three months leading to the killing of 150 military officials. At present, Turkey hosts more than two million Syrian war refugees that have imposed economic, political and social pressure on the country and even changed the demography in its border cities. Turkish people are concerned about the massive influx of displaced people from Syria into their country. Furthermore, the recent terrorist attacks in the capital Ankara and the bombing in border town of Suruc in July, killing more than 120 people, were a sign of increasing insecurity in the country. Although no group claimed responsibility for the attacks, the blame was put on ISIL terrorists. Supporters of ISIL arrive in Turkey just as tourists do on a daily basis to join the terrorist group. This has caused borders more insecure and harder to control. The Syria crisis and Ankara’s failure in its policy of “zero problem with neighbors” has posed a challenge for the AKP. The discourse of “zero problem with our neighbors” was a slogan summarizing Turkey’s expectations with regards to its relations with neighboring states. But now, due to its wrong policies, Turkey has become a neighbor with the ISIL in its southern borders and Kurdish forces in Syria have grown in power. Several polls have found most Turks are opposed to the interference of their country in the ongoing conflicts in the neighboring Arab state but the Turkish government still insists on support for anti-Assad and terrorist groups and the ouster of the Syrian president. The confrontation with the European Union is another struggle that Turkey faces. The EU is critical of Ankara’s violations of civil rights and values. 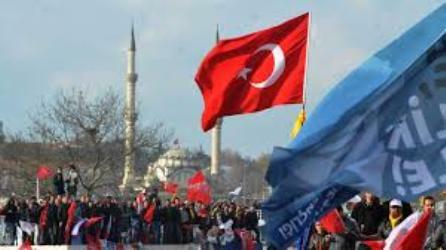 Turkey launched its bid for EU membership a decade ago, and remains far from meeting most conditions to join the bloc. The country is under mounting pressure to ease limits on free speech and allow judges to act independently in order to give a new lease of life to the EU membership bid. But now that Europe is directly affected by the arrival of hundreds of thousands of refugees, it has adopted a softened policy. Turkey says it needs €3 billion in aid to shore up its borders. At a recent EU summit, leaders made positive noises about a deal but didn’t delve into specifics. But when German Chancellor Angela Merkel visited Turkey last month, she hinted at other concessions in return for greater cooperation on dealing with migrants — namely, visa-free travel in the EU for Turkish citizens and, ultimately, full EU membership. Anyway, opposition groups fear the party would exercise absolute authority. Many liberals and secularists who at first supported the rise of the party are now blaming themselves for paving the AKP’s path to a monopoly of power while others view the reelection of the ruling party as sign of restoration of security and stability to the country.